~: What is Tachometer Function on Vehicle? Since about the mid-1980s, tachometer started to become standard equipment for vehicles and installed side by side with the speedometer. What is tachometer function and how to use tachometer? 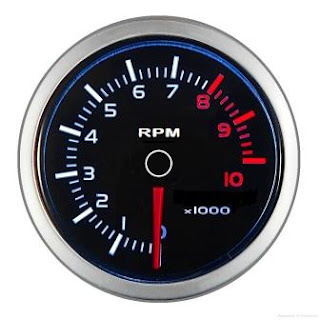 Tachometer or sometime is called: revolution counter (rev-counter), RPM gauge, etc., is a tool that measures the rotation of the engine crankshaft . Unit of measurement is Revolutions Per Minute (RPM). Mechanic uses tachometer to set the lowest engine rotation (engine idle speed), which ranges from 500-1,000 RPM, when not using the air conditioner. If the a/c is turned on then the engine rotation should be raised to about 100-200 RPM higher, in order to obtain the power to turn the a/c compressor. Engine speed is increased automatically to drive air conditioner, mechanic only adjust how high the idle speed when a/c on and when the a/c off. We can use tachometer to ensure engine speed is not higher then allowed (redline). For passenger cars are usually maximal engine speed is limited to 6,000 RPM, some vehicles have angine which can reach 7,000 RPM. For jeep, pickup and truck with Diesel engines usually about 4,000 RPM maximum. Motorcycle engine have a limit of 12,000 RPM rotation, some can reach to 17,000 RPM. Engine on a formula one race car can reach to as high as 18,000 RPM. High engine speed usually occurs when the vehicle is accelerated, or slowed down using compression (engine brake). If the engine maximum revolution is exceeded, it will cause more rapid wear and tear on engine components, sometime may cause engine jam. Some of consideration that determine the maximum limit of engine speed are: the ability of engine lubrication systems, component mass, component balance, component composition, etc.. Diesel engines typically have a lower limit due to the limited revolution of the fuel injection system. Motorcycle engine has a very high speed limit as it has lighter weight components, especially on reciprocating motion parts such as piston, connecting rod, valves, etc..Some vehicles are equipped with a engine speed limiter which will reduce the amount of fuel injected to avoid engine over speed. Some of the vehicles used to pull heavy loads such as trucks and tractors, have tachometer equipped with blue or green lines that express the revolution in which the engine produces maximum torque. Torque is power (Horse Power) divided by rotation (RPM). On trucks and tractors, power is required at low speed in order to get large torque to pull heavy loads. Maximum torque of truck and tractor can be achieved on very low engine speed around 1,500-2,500 RPM, some time it is called low end torque. So the driver does not need to press throttle pedal deeply when pulling heavy loads, also the driver does not have to constantly use low gear when pulling heavy loads. If you are driving a truck without pulling heavy load, you can go up hill with 5th gear, if you are driving sedan you probably should shift to 3rd gear to go up hill. It is because truck engine has better low end torgue, while sedan engine has better high end torgue or high RPM torque. On passenger vehicles such as sedan with manual transmission, tachometer can be used to determine the best time to change gears. Usually for the economical use, gear can be shifted to a higher gear with engine speed around 2,000-3,000 RPM, if going up hill or pulling heavy loads then gear shifting must be done at a higher engine speed, up to 4,000 RPM. On vehicles with automatic transmission, the driver is no longer pay too much attention to the tachometer. In the racing car or racing motor bike, tachometer is not only used to limit the maximum engine speed, but can also be used to measure the speed of the vehicle. Because modifications to the wheels and the transmission, then standard speedometer no longer works accurately. So racing car and bike use tachometer to measure speed. By knowing transmission gear ratios and wheel circumference, so wheel rotation can be obtained for a particular engine speed. By multiplying the circumference of the wheel with the wheel speed, then vehicle speed will be obtained. See article The relationship between RPM, Transmission, Wheel, Speed ​​for more detail. Nowadays GPS (Global Positioning System) has been popular, vehicle speed measurement can also be done with GPS. Because of its small size, there is a GPS that can be used in cell phones and for bicycle is also available.